Last Saturday I visited our local farmers market in search of some good peaches to make jam. Oh, what a great place to be at this time of the year! There was a great variety of veggies and fruit, herbs and flowers on display! 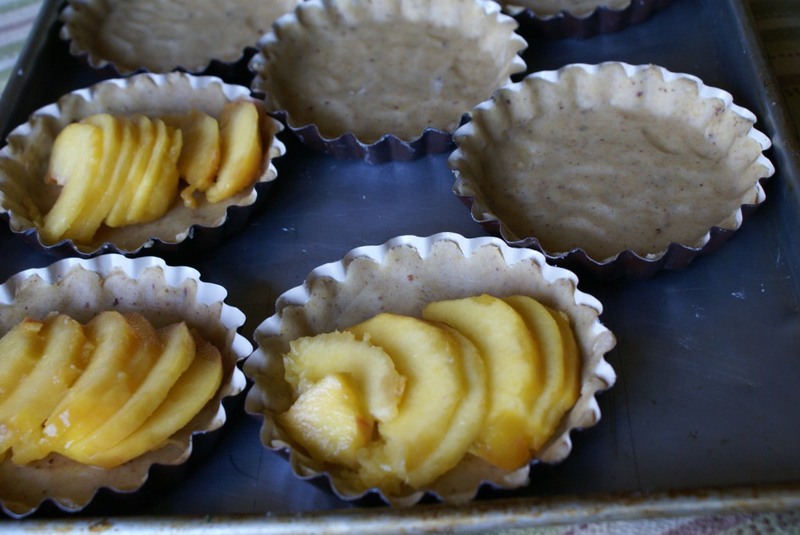 I picked up a large container of Michigan peaches for my jam, but they were so juicy and sweet that we couldn’t stop eating them and from what was left I made these lovely tarteletts. I am making jam next week (said with determination)! 🙂 This recipe is a combination of three different recipes with addition/subtraction of some ingredients, which resulted in this recipe. Isn’t that what baking is all about?! The tarteletts turned out to be delicious and not too sweet, which I really favor. 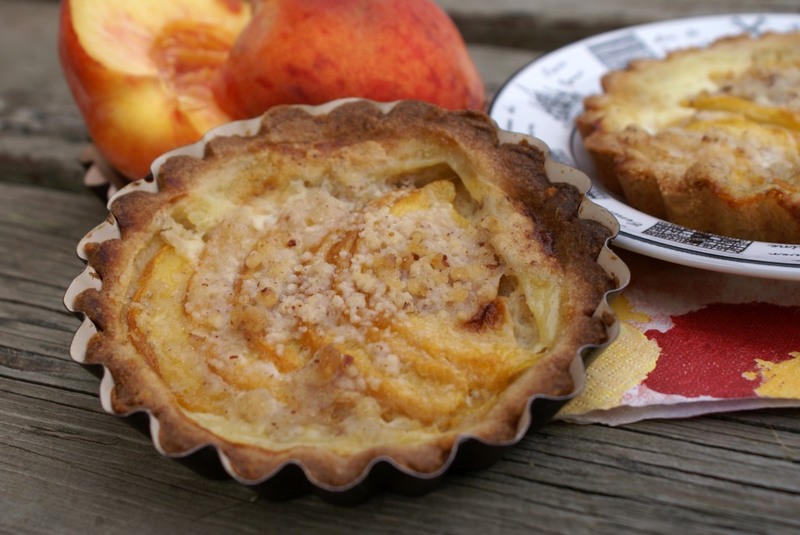 You could taste the natural sweetness of the peaches, creamy filling and hazelnuts. Next time I would try to use almonds instead of hazelnuts. I would also sprinkle some sliced almonds on the top for decoration. ***All ingredients need to be refrigerated before using for the pastry. This is a ½ of quantity of the recipe for the sweet pastry from The Bourke Street Bakery Cookbook. Original recipe doesn’t call for hazelnuts/almonds. Combine flour, salt, powdered sugar and hazelnuts and mix thoroughly. Add butter and start mixing slowly to incorporate all into flour. Add one by one egg and form the dough into a ball. Divide the ball into two equally weighing discs. Wrap each disc with plastic and refrigerate for about 2 hours. Streusel is basically a crumbled mixture of butter, sugar and flour and it’s used for sprinkling over pies or cakes to add an extra crunch. Combine and mix all ingredients until they resemble ¼ inch (1/2 cm) crumbs. Set aside. Cut a small cross on the top and the bottom of each peach. Place the peaches shortly into boiling water, remove and let cool. Peel, half and pit the peaches. Cover with plastic until ready to used them. Combine milk with sugar and both extracts, stir by hand for a couple of minutes. Add eggs and stir for another two to three minutes, until you get a smooth mixture. Set aside. Remove the sweet pastry dough from the fridge about 15 minutes before you start making tarteletts. I lightly grease the tins with butter. Roll the dough out to about 1/2 cm (or just under 1/4 inch) thickness. 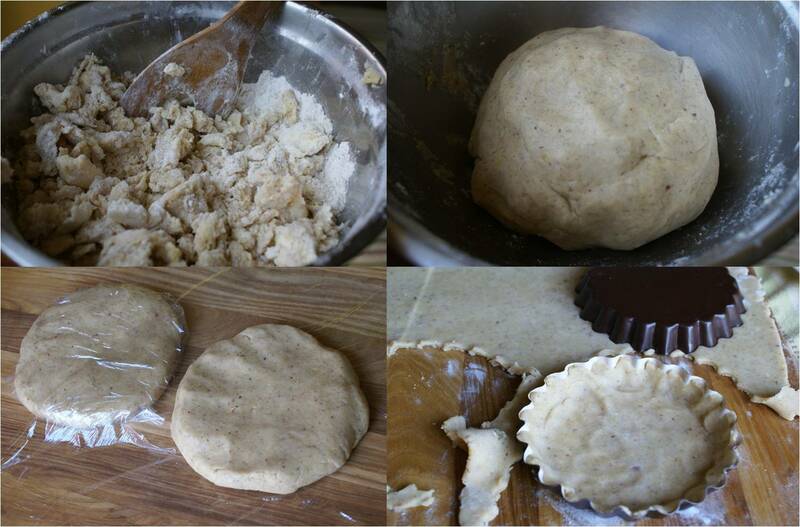 Use a tartelett tin as a cookie cutter and place the cut out dough into the tin. Lightly press in and make sure to have a nice and clean edge. 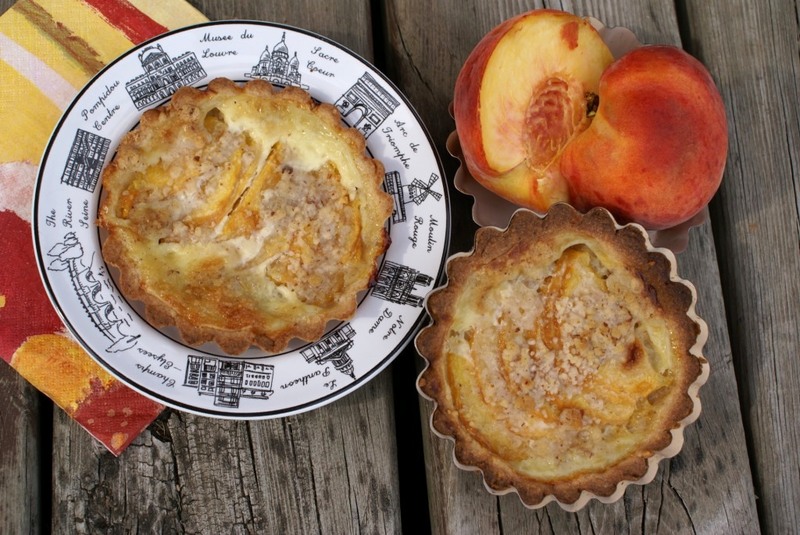 Cut each peach half into thin slices and arrange them on the top of the tartelett. Pour the filling over the peaches. Do not overfill. Sprinkle with hazelnut streusel. You can also choose to sprinkle streusel in the middle of baking time. (I figured it doesn’t make much difference for the final product). Place the tins onto a baking sheet. Bake at 215 C (about 425 F) for 20-25 minutes, or until edges of tarteletts start getting golden-brown. Cool completely, remove from the tins and serve. You may choose to sprinkle them with powdered sugar. You can also serve them with a scoop of vanilla ice cream. Ha, I’ve been doing the same thing with peaches – buying a bunch to make jam or something, then eating them all before I can get around to it. So good! These look absolutely wonderful – such a great way to celebrate summer fruit 🙂 Wish I’d been there to taste one! You are right, Sibella, this is a season for wonderful tasting abundance of fruits and vegetables. 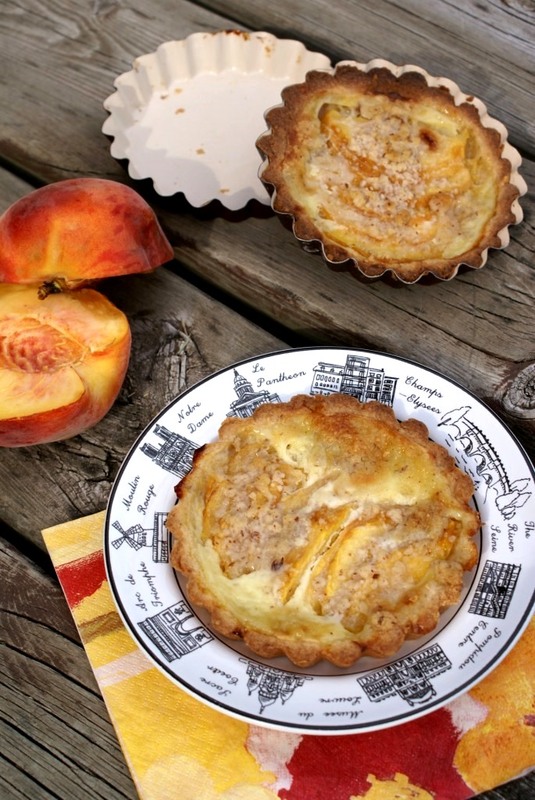 These peach tarteletts with nuts look absolutely scrumptious. Yumm! 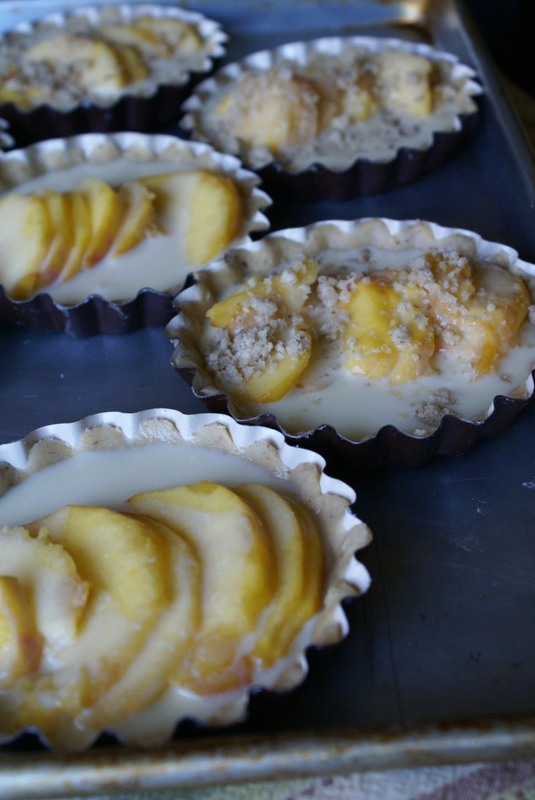 My daughter just introduced a new stone fruit tart with a crumble topping on her restaurant menu. It is already popular, and I see why from your beautiful images. What a delicious way to celebrate the approaching fall weather, Sibella. Thank yo Kathleen, can’t wait for the fall. It is too hot here! Thank you so much! 🙂 Those are pretty good tins, this was actually the first time I was using them (couldn’t resist buying them when I saw them at the story at a very cheap price).